Personalize four 16-oz. pilsners with any name—up to 14 letters. These beer glasses make a great gift for your favorite brew-meister or a fun way to serve up suds at your neighborhood pub. Make Your Beer Service Personal Personalize four 16-oz. pilsners with any name—up to 14 letters. 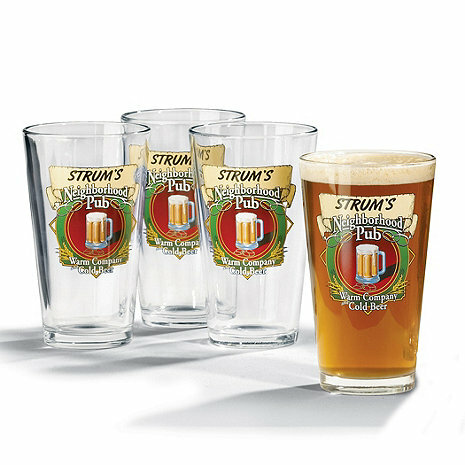 These beer glasses make a great gift for your favorite brew-meister or a fun way to serve up suds at your neighborhood pub. Machine made of lead-free glass, decal contains some lead. Recommend to hand wash. NOTE: Only name can be personalized. The words "Neighborhood Pub" and images are pre-printed and cannot be changed. " 'S " (apostrophe + S) is not automatically added to personalization. " 'S " is counted as 2 characters and must be requested at time of order, otherwise it will not be included. This product can not ship internationally. The whole reason for these glasses are that you can personalize them. You must specify a name when ordering. BE CAREFUL I simply wrote my husband's name, STEVE. The glasses came exactly as I specified so they read " STEVE PUB"
The glasses are now a joke in bad grammar and not usable for guests. Fun beer glasses brighten your bar! I bought these personalized bar glasses for my husband's birthday. He loves them and they brighten our bar. This item was purchased as a Christmas gift. The recipient was so pleased and impressed! Great gift - good quality, attractive and was well received. Great gift for newlyweds who like to casually entertain. Delivery was prompt, but I received an email (apparently in error) that the glasses had shipped. I emailed customer service to ask the shipping number and received a not too nice email saying the email was sent in error and a reminder that the glasses would take 6-8 weeks to ship. I wouldn't have asked if I hadn't been sent an email saying they had been shipped! George's bar now official !! Great look at minimum price. [...]. A great combo with the "growlers" I purchase at local brew pub. Updated my shipping address, but the shipment was still addressed incorrectly. Hard to monitor progress of shipment. Didn't receive shimpent information until the day the shipment arrived. No updates for progress of order. Purchased this item for a relative who has a bar in their basement. He liked the personalization of the glasses. My husband loved the gift. We had a party and everyone wanted a set. I only wash by hand and they still look new afer a year and a half. I'm now buying a set for a friend's birthday. Presentation was great...given as a gift for our neighbor's bar! This was a gift and I liked the custom imprint but the glasses overall were less than impressive for the price. A little pricey for 4 glasses. The product is okay, but I ordered it 2 weeks before Christmas as a gift for someone and they did not receive it till almost the end of January. When I called to inquire about it after Christmas they just said "yes we were supposed to have those items there by Christmas but we had issues and now our manufacturers are closed till New Years so there really isn't anyting we can do." I was beginning to think I got scammed and would never actually receive anything but finally about 3 weeks after calling them I did receive the package. I do not think I will be purchasing anything here again. The product is not worth the hassle.